I love showers. I’ve never been a bath person, at least not since I was a little kid, although my mother loves to regal people with stories about how (as a toddler) I screamed and cried and carried on whenever she tried to put me in the shower- we didn’t have a bathtub in the house we were living in at the time. Then one day when I was about three or four, I suddenly decided that showers were acceptable after all and I haven’t looked back since. Here are 17 ways to save money when taking a shower. 1. Take a shower. 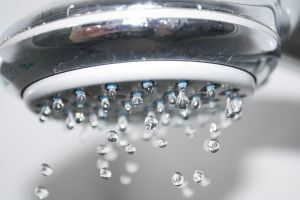 We use a lot less water when showering (during an average length shower) than when filling up a bath. 2. Do all your beautifying before you get in the shower. Then you can rinse off in one go. Whenever I’m having a ‘spa day’ (said with the greatest of irony) I polish, pumice and peel right before hopping into the shower. It doesn’t save me time in the bathroom, but it does save water, as I, for example, do all the applying and rubbing of the face mask without the water running. 3. Make your own beauty treatments. Speaking of ‘spa days’, I like to treat myself every now and then to some nice beauty treatments, usually deep conditioners for my hair. But I will also use homemade stuff too, my current favorite being either a sugar/olive oil scrub, or a sugar/honey scrub. You only need about a tablespoon of each (I don’t use it enough to make a large batch), and I love the way it makes my skin feel. Warning, this might not work for everyone’s skin or all over- I only use it on my arms and legs, for example. 4. Use less soap. The French use a lot less soap then Americans do (this is a stereotype that’s actually true), but their skin is better for it. Soap is really drying, so try using a ‘beauty bar’ instead. I love Dove products, as much as for the product itself as for their commercials like this one (warning, music). 5. When using soap, or your beauty bar as the case may be, wash only the ‘under’ areas: under-arms, under-wear, under-shoes… let the water run over the rest, of course, and don’t actively try to avoid the soap hitting the rest of your body, but actively soap only those three. You’ll save money on soap and your skin will thank you. 6. See what you can do without. I don’t use shaving gel, for example. The water treatment works for me. Some people need shaving gel, but can do without conditioner… but in either case, actively ask yourself what you really need to have, and what you never use. 7. Finish one thing before starting another one. This could be my life lesson- at least the one I need to work on the most- but it applies to bath products as well. We recently stayed with some family members, and they must have had at least 50 bottles of product in their shower area. It was fun looking at and trying some different things (we had their permission, of course! ), but in the end you’ll save money and space if you only have one of each kind of thing. We have shampoo and conditioner for me, shampoo for the hubby, shampoo for the kids, dandruff shampoo, and I still consider this to be a lot (although I’m too attached to the way Pantene smells to give it up for me, yet unwilling to share with DH or the kids- that stuff’s pricey!). 8. Get reusable. Instead of using a body scrub, even if it is one that you make yourself, why not try using a loofa pad or sponge. I use less soap when I use a body puff, and I found a basic body brush that I use almost daily; I got a plastic one, so that I could leave it in the shower, even if the wooden ones look nicer. 10. Use a shower squeegee after each shower. If you wipe the water off the walls, then as the walls dry there won’t be water spots or calcium build-up. 11. Spray diluted white vinegar on the (tile) walls once a week just before you take a shower. The vinegar won’t hurt you as you shower, nor will you come out smelling like a pickle. Then squeegee the walls as per normal. 12. Use a microfiber cloth to polish the faucet and handle. You won’t need a cleaning agent and they look really nice after. 13. If you’re not afraid of slipping in the bath, then you can polish your tub with baby oil after cleaning it to keep soap gunk buildup to a minimum. I, however, am deadly afraid of slipping in the bath, so I don’t do this. 14. I use a good quality scrubbing sponge, so that I can use a minimum of cleaning agent. And then I polish with the same microfiber cloth as for the taps. 15. Use an inexpensive curtain liner (Ikea sells some for about €1/$1). Guests won’t see it, so it doesn’t matter what it looks like as long as you can’t see it through the shower curtain. If you use a plastic shower curtain liner then your nice shower curtain will last longer, especially if you wash it every few months. I had a nice fabric one that lasted 4 years until it started fraying (not fun with cats). 16. Keep your shower curtain closed. It will dry better and last longer. 17. This last tip comes from Emily. Keep your drains in good condition with 1/2 cup each of baking soda and vinegar in the drain, followed 10 minutes later by boiling water. As always, be careful with chemicals (keep a window open) and don’t splash yourself with the water! How do you save money in the shower? Share your tips! I save by showering less often, opting instead for a quick daily sponge bath. That was what we did in the mountains as a kid in the summer to conserve well water. In Australia, they sometimes stand in totes when they shower and use the water to water plants and things. I’ve done that to save the water to flush the commode (when I’m really feeling thrifty). I don’t use conditioner, and instead of shampoo I use baking soda to wash my hair. It works just as well and you don’t have that heavy perfume smell (or cost). I just use plain ole’ bar soap to wash off with a washcloth, and that same soap is what I use when I shave. I just found this site. I look forward to reading your other posts! I shower less often (though if I exercised more regularly that would probably change) and wash my hair less often. I still soap up everything, but I use a scrubby thing (flat like a washcloth with lots of holes) that gives me lots of suds for very little soap. My bars last a long time. I switched to using bar soap with a lot of shea butter instead of fancy shower gel and it’s much faster to rinse off. I also quit shaving my legs. That saves me lots of time and water! I don’t run the water while I shave. Instead, partly through my shower, I plug the drain and let some of the water build up. Then I get out of the shower, dry off, and shave my legs. I usually use a beauty bar instead of shaving cream, and I just rinse off. =) Our water bill this month was 14 dollars!! For a family of three. Go us! That’s truly impressive- good job! I use shampoo instead of shave cream. I have very long hair so naturally use much more conditioner than shampoo, so one day when I was out of shave cream I tried the shampoo. One drop is all I need for each leg. Now I should finish the two bottles at about the same time instead of having left over shampoo (which I have heard is a great product to swish toilets with) Also, I only wash my hair every other day. Saves a lot of time not having to work with the curls, and the $ too of course. On the day I don’t wash it, I just pull it back into a clip and go. 1. Set the temperature setting higher on hot water tank; insulate tank with special blanket. Also, consider installing a relay switch which allows for instant hot water saving water lost while waiting on that perfect temp. 2. Don’t forget to use the bucket in the shower as well as after taking a bath, water is a precious commodity. 3. Yard sales, thrift stores, Craig’s List, and Freecycle are good resources for towels, shower curtains, and misc. decorating items. 4. Think Dollar store for misc. items such as q-tips, cotton balls, soap, et al. 6. Keep the toilet in good repair; otherwise, your water bill could go out of site! 7. If you are one of those with many, many bottles; Stop buying and Use up what you have! 8. Pack an ‘Emergency Box’ containing back-up items such as a pack of toilet paper, bar soap, toothpaste, floss, basic first aid supplies, basic health care supplies, female products, and shampoo. Not to mention and extra $20 or two! Reason: You just never what know. Take a Sailor Shower—that means turning the water off while you soap up & turning it on to rinse.